If you enjoy the art of pipe smoking you are in for a treat. 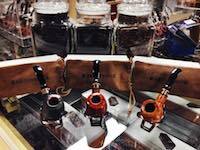 We carry hundreds of smoking pipes and multiple varieties of tobacco in our Edmonton area shop. Erik Stokkebye 4th Generation Pipes – Hand crafted in Denmark, each pipe comes with it’s own leather pouch. Featuring beautiful grain and superb stem work, these pipes are a sight to behold. Pictured is the “1897 Dark Porter” shape on the left, the “1897 Mature Orange” shape in the middle, and the “1931 Vintage Natural” shape on the right. Peterson Pipes – Just released for Christmas 2016 is this gorgeous Peterson Pipe with red and black rustication and glittering, deep-red stems. These pipes are sure to get you in the holiday spirit! 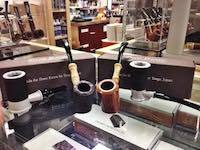 Established 1865 in Dublin, Peterson has a wide range of pipes to choose from. Tsuge Pipes For Drew Estate – These beautiful smoking pipes are produced by Tsuge (pronounced “Su-gay”) and Drew Estate. Led by pipe maker Kazuhiro Fukuda, Tsuge is known for making pipes in the classic Danish fashion with Japanese aesthetics. The pipe has always been associated with gentlemen of leisure and intellect…and now women are even getting in on the art of smoking a pipe! A trained tobacconist can really help you on the first and last part. Look at our displays of pipes and you will be dazzled and confused at the same time. Although the essence of pipe smoking is the same, each pipe will yield a slightly different experience based on the construction and materials used. 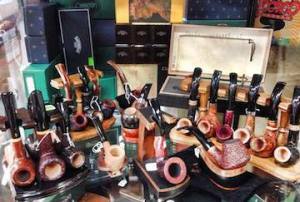 There are also a multitude of pipe tobaccos to choose from. Add to that, many stores actually mix their own tobaccos from a variety. For a unique experience be sure to try our Nottingham Tobacco Blend. Matter of fact, stick around long enough and you might even come up with your own blend! Fill the bowl of the pipe with tobacco. You will spend some time learning how to ‘pack’ the pipe. You don’t want the tobacco too loose or too packed. It is not uncommon to re-light the pipe every once in a while. So don’t feel that it is any failure on your part if it goes out…this is normal. Of course there is more to learn and explore. Pipe smoking is an art and soon you will be enjoying the many subtleties of flavor, different tobaccos and pipes can provide.